Forgive the lack of post yesterday; I had a migraine. No fun. After a 12-hour day at work, which culminated in a pounding headache and some minor regurgitation, I returned home to shower and crawl into bed with Doctor Who. The show, not the Doctor himself. It's not like they give you a Doctor of your own just for moving to England. We all need to take notes and make lists and jot down memorable "that's what she saids," and having some sort of little notebook on hand makes this a much easier process. When I was in fourth grade, I had a notebook that contained part of a bad murder mystery I was writing at the time and a list of my classmates who deserved to die. Primarily because they were jerks. Or boys. You know, the usual complaints when of a nine-year-old. 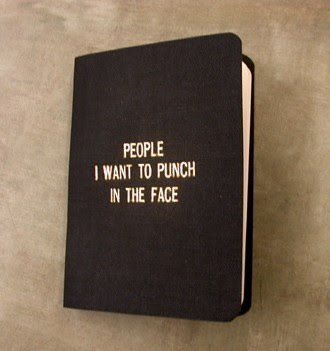 That might have been the perfect occasion to use this Rude Little Black Book. At present, I think it might be useful for things more along the lines of shopping lists or errands, but I can still appreciate the cover sentiment. As of this writing, the Rude Little Black Book is sold out, but the seller promises to make more soon.